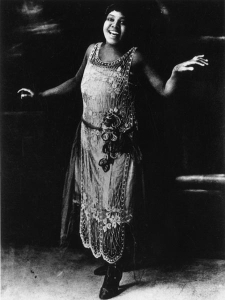 Bessie Smith was the voice of the Roaring Twenties. If there was one major female figure in 1920s jazz it was Bessie Smith. Her voice has been described as regal, powerful, authoritative. She was able to take her voice to new heights because in her younger years she learned to project her instrument) across large spirited crowds of people without help from a microphone. The power of Smith's voice was her trademark and as she matured her talent deepened and she became adept at capturing the spirit of the blues. She was often compared to the preachers of the south because of the "spiritual" tone of her voice. In 1921, Bessie Smith traveled north to Atlantic City and Washington D.C. where she met saxophone player Sydney Bechet. This relationship became romantic and Smith bought a house in New Jersey. She was signed by Columbia Records and sold more than 6 million records (a record at the time). Smith's music was considered rough by many, but obviously popular in the widening circles of those who appreciated jazz and the blues. Her style transformed the way people heard words and phrases, she breathed life into even songs with sub-par lyrics. She was an individual with a talent that lent itself perfectly to the experimentation that ruled music in the 1920s. Thus, well-known musicians sought Bessie Smith out. In 1925 Smith and Louis Armstrong teamed up to record several songs. It's widely known that the two talents clashed, with one trying to outdo the other. It's said that Armstrong was the first trumpet player to be able to match the tone of Smith's tremendous voice. She was usually able to make most other musician sound bad. This competition brought the best out of both artists. Smith's greatest talent, her powerful voice also led to her downfall with the invention of the microphone. Other, less powerful singers had evened the playing field. In the waning years Smith branched out, doing a movie called "St Louis Blues"
"It was like she had that hurt inside her all the time, and she was just bound to find it." Smith was killed in a horrific car accident in Mississippi in 1937.